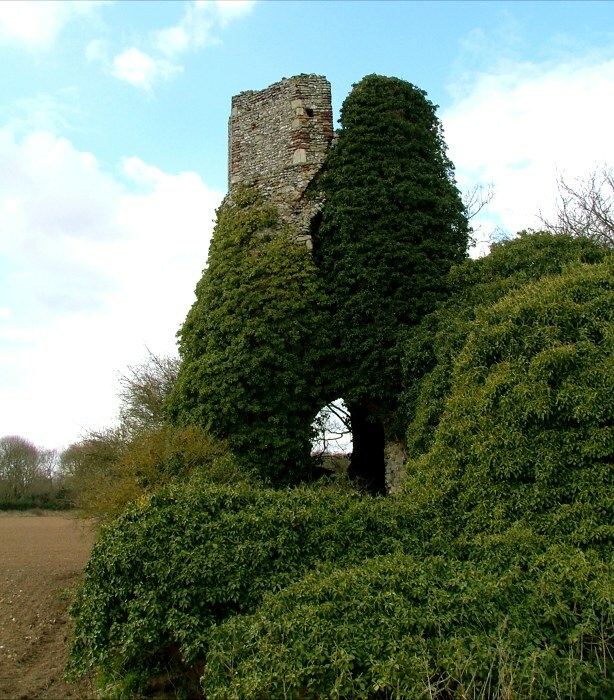 In the middle of a wide, ploughed field just to the west of Caister, this magnificent ruin stands, like a castle adrift on a brown sea, a city of the plain. Chris parked on the edge of the field, and we were still a good quarter of a mile from it. Not unreasonably, having been here before, he waited in the car while I set off for the ruin. As far beyond it, a line of wintry trees seemed another country. Beneath my feet the soil was sand-like, powdery, quite unlike my recent experiences of getting bogged down in the mud of central Norfolk. Here, it felt as if a sudden gust might lift the soil and leave me walking through a cloud. There is a public footpath to the ruin marked on the Ordnance Survey map; but, with the recent shallow ploughing of the field, all trace of it had disappeared, and so I had to try and follow its course in my imagination. I loved this. It was like walking across virgin snow, my footprints the only jarring in this vast expanse of curving, parallel lines. Occasionally, I looked back at the road, which receded into silence as I moved further from it. Ahead, the tower was more like a fortress than a church. I tried to imagine what it would be like if I was an invader, if there were forces there to try and keep me out. Burgh St Mary is not to be confused with Burgh-next-Aylsham and Burgh Parva, both of which have churches dedicated to St Mary. 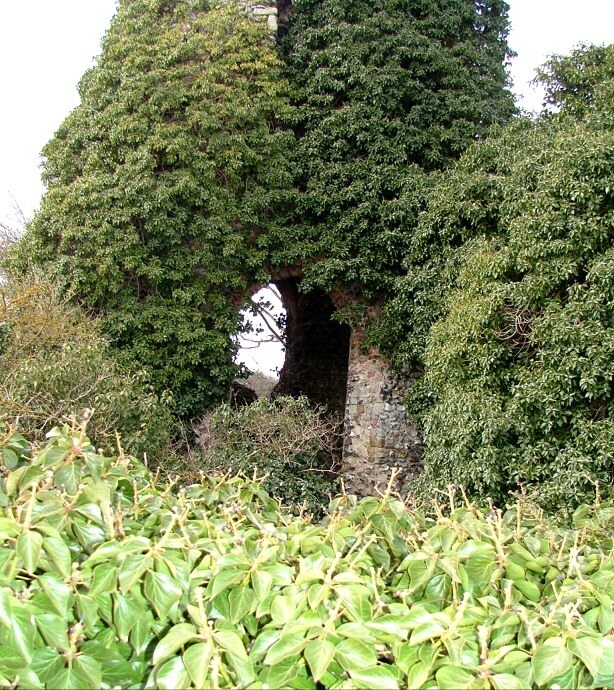 The parish here is adjacent to Burgh St Margaret, and after the Reformation this was the church which fell into disuse. Ironically, St Margaret was almost completely rebuilt in the 1870s, and so more of the medieval St Mary survives than of St Margaret. As I got closer, the nervous jackdaws noticed my presence, and it spooked them. They rose from the tower in a worried flurry, seeking the higher ground of the adjacent treetops, from which they watched me warily. 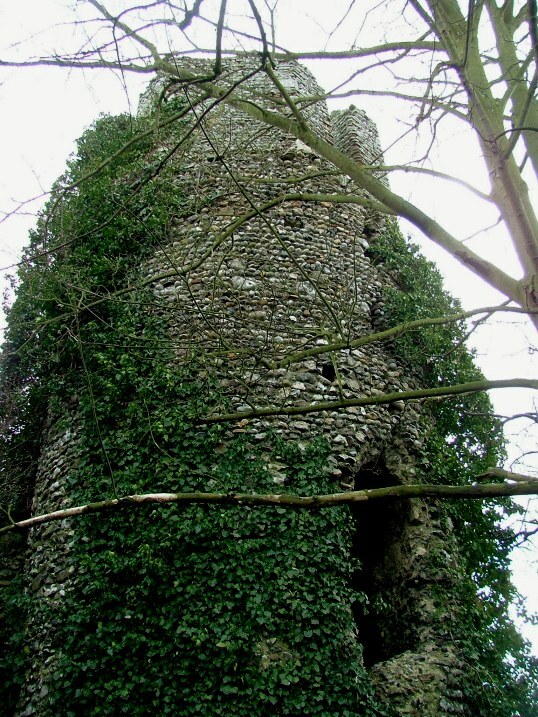 The remains of the round tower top are octagonal, a bell stage. 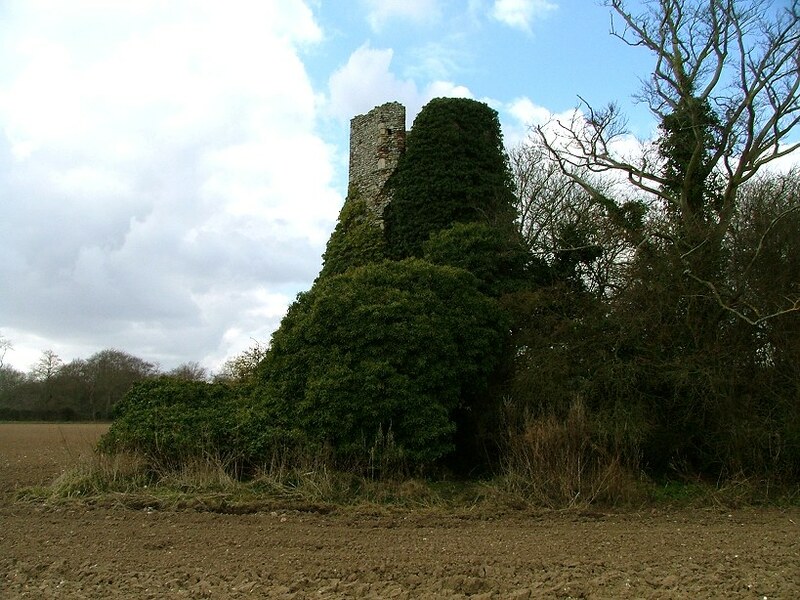 Because of this, the tower appears square from the road. 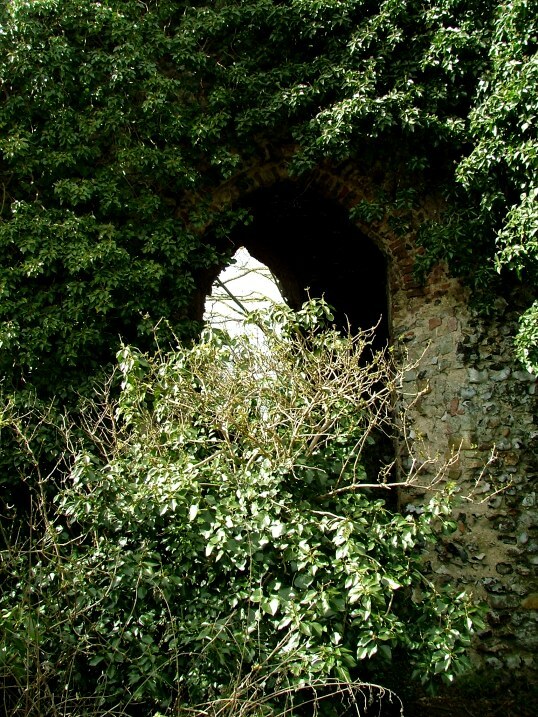 I got to the island of trees, and parted the brambles to climb inside. 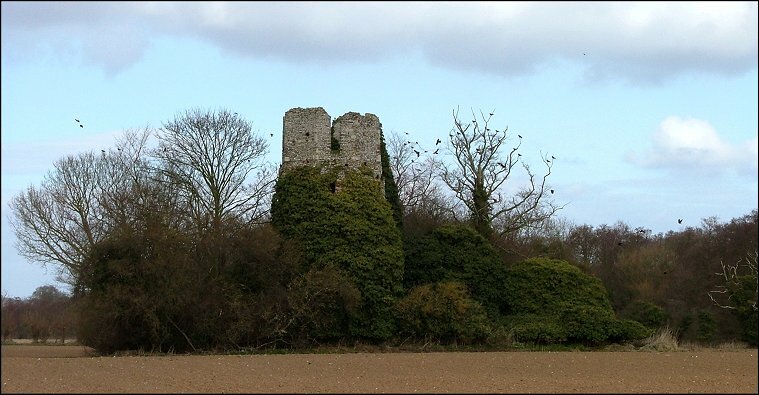 The wind had dropped completely, and there was a deep silence, apart from the occasional squawk of a distant jackdaw and a persistent rustling on the far side of the tower. 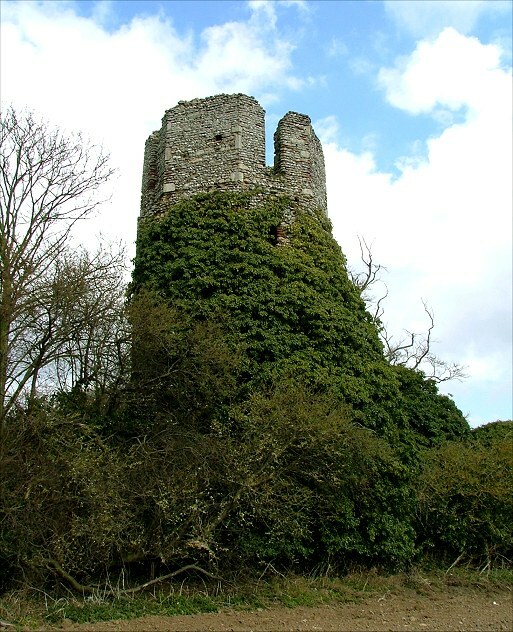 Except for the bell stage, which is probably 13th century, the round tower was early Norman, and archaeological investigations of the site suggest a similar date for the rest, at least what survives, which isn't much. 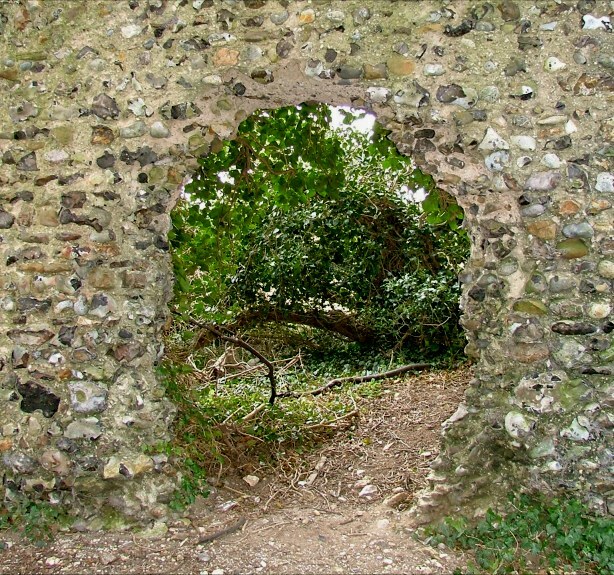 The north wall is good up to a certain level, and you can still see where the north doorway was. As I walked around to the north side I could see that my rustling companion was a plump pheasant, which put its head down and ran for the chancel, or at least where the chancel used to be, before breaking through the cover and erupting like a helicopter into the field. As he disappeared, the copse lay still again. I walked into the nave. 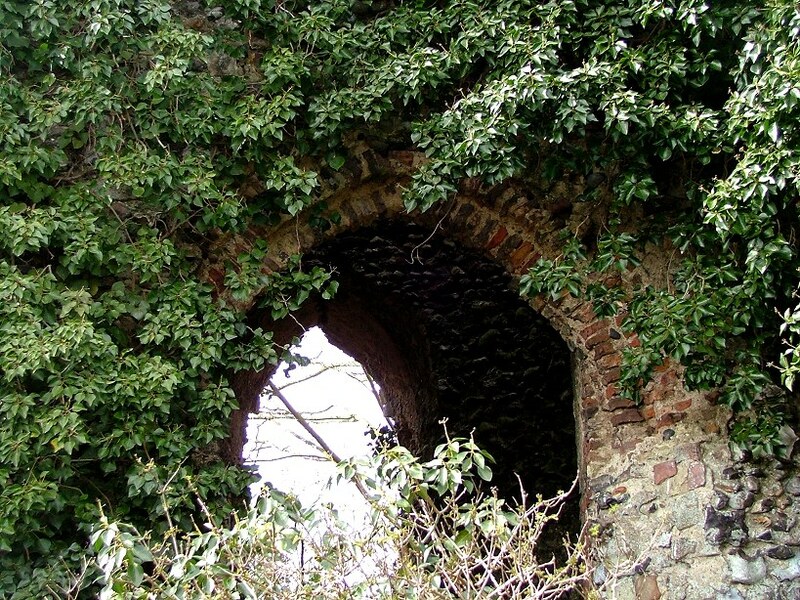 I noticed that the tower arch was made of brick, so perhaps there was some work going on here in late medieval times. 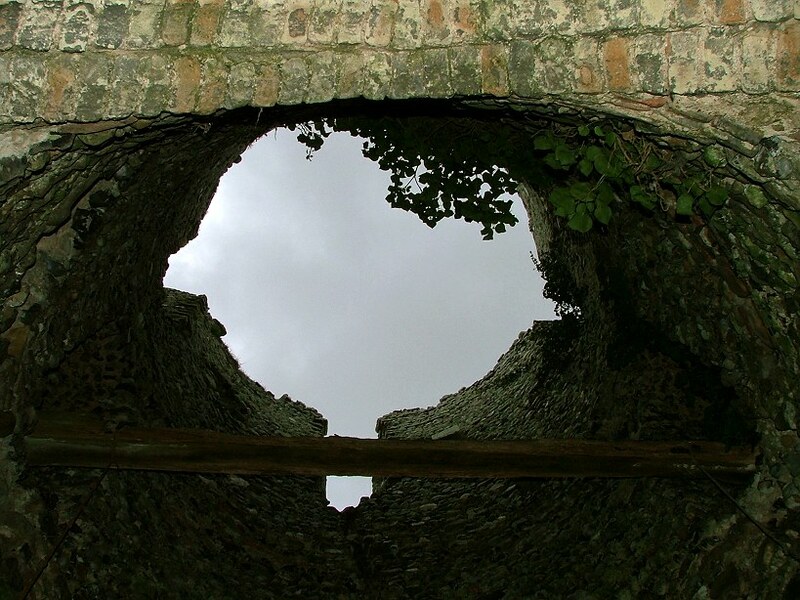 I stepped through to the space beneath the tower, and looked up. The circular interior tapered slightly, like a chimney, and a wooden beam was wedged between the inner splays of the windows. Someone had tied a rope to this, but it didn't look secure, and so I didn't climb up. Instead, I lifted my camera to take the photograph you see on the right. The flash filled the funnel with light for an instant, and in the next second a huge white shape, a ghost, fled from one of the window splays and fell towards me. It opened two white arms; for a moment, its round face looked into mine. And then it stalled furiously, and threw itself up the chimney again, exploding out of the mouth of the tower. It was a barn owl, the colour of snow. I stumbled clumsily back out through the north doorway, to the edge of the copse, in time to watch it receding, wings pumping lazily, powerfully, effortless in its straight, dipping course, drifting across the wide field to the woods beyond.